Recently I blogged briefly on what the Apostle Paul had to say about the baptism in the Holy Spirit, where he taught that it is something that all members of the church (metaphorically called the ‘body of Christ”) take part in, just by virtue of the fact that they are spiritually counted as members of the church. My friend Geoff made a comment on that blog that prodded my memory. He said, “I’ve always wondered if what’s in view here is the difference between the old covenant (the temple, and therefore John’s baptism), and the new covenant, which means closer more personal relationship with God through Christ, and therefore the Spirit.” Geoff’s reference to the temple reminded me of another important New Testament passage that talks about the relationship between the Holy Spirit and believers. I’ve heard it said plenty of times by evangelicals that we, each of us as individual Christian people, are temples of the Holy Spirit. The Spirit of God literally lives in each of our bodies. As a way of encouraging us to show respect for our bodies I suppose the idea might have a positive spin off. But theologically it really misses the mark, and it prevents us from seeing something important in the New Testament. The apostle Paul refers to the church as the temple of God or the temple of the Holy Spirit five times, and if we look at these examples, it is clear straight away that for Paul the idea of the temple of God or the temple of the Holy Spirit is not an idea that applies primarily to individual people. Part of the reason for the misconception is that English, unlike Greek, has only one form of the word you. Our language does not distinguish between singular and plural, but Greek does. I remember listening to a talk given by Joel Green where he whimsically commented that he wished that the New Testament had been written in the southern states of America. There, at least, the language enables one to specify that one is talking in the plural by using the word y’all. I certainly agree that a distinct word for the plural form would be very helpful when it comes to understanding what the writer was actually say. For example here’s a significant case where the apostle Paul says that “you” are the temple of God or “you” are the temple of the Holy Spirit. I have used the word y’all wherever Greek is plural. 1 Corinthians 3:16-17 – Don’t y’all know that y’all are God’s temple [singular] and that God’s Spirit dwells in y’all? If anyone destroys God’s temple, God will destroy him. For God’s temple is holy, and y’all are that temple. One thing is strikingly clear. There is one temple, and it is composed of y’all. Not one of you, but all of you. These are two of the verses out of the five. One verse that uses the temple metaphor does appear to be different, yet not consistently so. In 1 Corinthians 6:19, Paul is telling the people of God not to engage in sexual immorality with prostitutes, and he says “do you not know that your [plural] body [singular] is a temple [singular] of the Holy Spirit within you, whom you have from God?” I actually find this a little strange. In context Paul is telling individuals not to commit immoral acts with their bodies, but he still says that the church, collectively, has a body that is the temple of the Holy Spirit. I confess, I just put that in the “I don’t know why the writer chose exactly those words” category. For through him [Jesus] we both have access in one Spirit to the Father. So then you are no longer strangers and aliens, but you are fellow citizens with the saints and members of the household of God, built on the foundation of the apostles and prophets, Christ Jesus himself being the cornerstone, in whom the whole structure, being joined together, grows into a holy temple in the Lord. In him you also are being built together into a dwelling place for God by the Spirit. The old temple was made quite literally of stones. Now, God dwells with us, in our midst, and the temple is made up of stones of a sort, but not literal stones carved out of the rock. We are the stones – living stones – that make up the household of God, the temple. What I think these texts call us to do is to move towards a view where the Holy Spirit has come into the church, the new temple, the body of Christ, and we take part in that Spirit by being part of that temple, by being united to the body of Christ. They draw us away from a mindset that says “Give me the Spirit.” Our approach should not be one that invites the Spirit of God to inhabit us, like our own possession, but rather we should be caught up in the larger work of the Holy Spirit in this world, which involves being part of the place where the Spirit dwells, namely the church. For those to whom the title of this blog entry made no sense, hopefully it does now. And for those on whom the historical reference is lost, see here. It is through being a part of the body that correct individualism is expressed, and most fully. Your expressions are reminiscent to Paul expounding on what it means when we are all part of the body. The ear both functions best and expresses its individuality best by being part of the rest of the body, the not-ears. And so we come together as one, the Church. This is a good rejoinder to people who look down on the church community noting various spiritual flaws and then seek to be a Christian at home because they don’t need the church they can talk to the holy spirit at home. The most exciting thing about this is, I finally got quoted… by someone with a PHD! Not sure if we’re violently agreeing here Glenn, but your point that we aren’t in-dwelt by the HS as individuals but are as the corporate body of Christ seems to be rather semantic. A significant point Paul is emphasising in these passages is the contrast between the old Judaic legal/sacrificial/single location system and the new environment of the believers containing the presence of God (by His spirit). He was constantly having to beat back the effect of Jewish law infiltrating the freedom of the believer. So, how are you saying that these living stones are made alive if not through the in-dwelling/receipt/filling/covering/surrounding of individual believers by the HS? In John 16 Jesus is very explicit in declaring that he will come to live in believers, but that is only accomplished by the HS. You state that we should seek to be part of the larger work of the HS in the church, but we are the church so where does the HS reside? As some ethereal fog for the benefit of saved and unsaved, or through HS filled believers? If you are sealed by and through the HS, I believe we carry that seal just a blob of molten wax carries the impression of the seal pattern. We aren’t sealed because we fellowship with other believers. Your case that we are devoid of the HS as believers is pretty flimsy from the texts used. “So, how are you saying that these living stones are made alive” – by virtue of not being dead. The contrast is between stones that are inanimate objects, and stones that are living creatures. “Your case that we are devoid of the HS as believers is pretty flimsy from the texts used.” Actually, my arguments that we are devoid of the Holy Spirit are not merely flimsy. They are nonexistent! So, by extension, in the first para of post 5, one could argue from your explanation that a non-believer mixing with other believers in church is a living stone and therefore part of God’s NT ‘temple’. It’s not a big leap. Just because we are living creatures does not qualify us as ‘alive’ in God’s eyes. He makes us alive when, by faith, we appropriate Jesus as saviour, and the seal of the Holy Spirit is then upon us to give us that expectation of eternal life after resurrection. Why then would Paul declare that we are new creations, or Jesus speak of new birth by the Spirit, if we hadn’t had something of God fill us and change us? Of course, we must view thngs as God sees them – outside of our concept of time, which is why Paul declares that we are seated in heavenly places. Obviously, we are not, but God who sees the beginning and the end inspired Paul to view ourselves in that paradigm. I believe scripture clearly states that your stance here Glenn needs to swing back from believers and non-believers existing in identical form and nature, towards God being the only giver of an eternal compenent (through our faith) of our nature this side of the resurrection – that of the Holy Spirit connected in some mysterious way to the believer. James, it’s a ridiculously huge leap. My argument is an exegetical one. The Bible speaks of us as collectively composing the temple of the Holy Spirit. You aren’t denying this (or at any rate you’re not attempting to rebut the exegesis), it just looks like you’re complaining that this doesn’t sit comfortably with the way you’re accustomed to thinking about it. 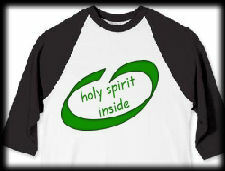 OK, to be perfectly clear, I agree with your exegesis that we are the temple of the Holy Spirit. No problems there. I sit comfortably with the notion that it is the Holy Spirit’s arrival in/around us on salvation (you select the description from the many relevant scriptures on that aspect) that creates us into a new living stone. Many stones = one temple. My complaint (if that’s what it is) is not my lack of comfort, but that you don’t make an exegetical case for the Holy Spirit NOT dwelling in individual stones. Indeed, you want to categorise 1 Cor 6:19 in the ‘At Odds with my Theory’ category. Perhaps we are splitting the same hair. All my point centres on (and given proper time and space I would dig out a raft of supporting texts but John 16 and the above scripture are a beginning) is the question of how to comprehend the temple of the Holy Spirit as the Body of Christ and, therefore, holy in God’s sight. The way I see it is that many living stones that are each a recipient of the Holy Spirit comprise Paul’s temple analogy. Well, in Paul’s theology it is the one temple in which the Holy Spirit dwells. The stones make up part of that analogy. My point in this blog entry is the way the temple metaphor works, and how the living stones metaphor supports that. If there is a different sense in which each individual one of us connects with the Holy Spirit (and nothing in this blog post denies this), then it is not actually connected to the temple/stone analogy that Paul uses. If there is such a sense, it is not in the passages I have explored here, and a new case will need to be found elsewhere.